It is easy as 1-2-3 to sell your junk car today. Sell your junk car today and get immediate payment when we pick up your car. Cash for Junk Cars! In order to get started, please fill out our simple form, or give us a call at 1-800-407-1969. We look forward to giving you top dollar for your junk car. Easy – Only takes 3 easy steps to sell your junk car within 24 hours. Price – Due to our extensive network of buyers/auctions throughout the United States, NationalCash4Cars.com is able to offer you the absolute highest price for your junk car. Stress Free – NationalCash4Cars.com buys all types of junk cars, all makes and models. Free Pick-up – Our professional drivers will come to your location to pick up your junk car, and give you your money on the spot. Convenient – 150 locations serving the entire United States, we are ready to buy your junk car today. Courteous – NationalCash4Cars.com works with it’s customers to ensure the smoothest selling experience; and strongly values the lifetime partnership with our customers. Were you aware how easy it is to get cash for junk cars? All across America every single day, people are trading in their old clunkers for cold hard cash. The cars are towed away, stripped down, crushed or shredded and melted down in literally minutes. Once they are melted and recast they can be used for a variety of things from parts for other new cars to steel for buildings or roads. It is a huge win-win because it not only helps the environment, but scrap steel is cheaper for manufacturers to use compared with raw iron ore or freshly made steel. OK, your car is melted and recycled into other things that are made from steel. Did you know that cars are the most recycled item with over 13 million cars being recycled (Steel Recycling Institute) each and every year. Considering that the average weight of a modern car is 4000 pounds that is a heck of a lot of steel that doesn't need to be made from ore. And since you get paid by the pound when you get cash for junk cars, that is a lot of cash in your pocket. - You get rid of your useless car that may even have been an eyesore and get cash in your pocket as well. Plus you get the good feeling knowing you have helped the environment by recycling your car. - It is so quick and easy compared to trying to get rid of a 4000 pound car on your own. Simply pick up the phone or fill out a web form at NationalCash4Cars.com and within hours you can be saying goodbye to your junk car and hello to cash in your pocket. Recycling a car is really a simple process. The first step is for you to sell your junk car to a service that is will to pay cash for junk cars. You can try local outfits or go online and try NationalCash4Cars.com. Either way you should get a quote for what they estimate your clunker will be worth. 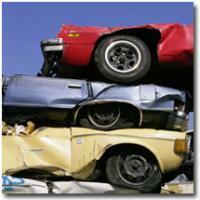 Once you get a quote it is a good idea to ask what the companies requirements are when they purchase your junk car. Some companies make it very easy and simply pick up your car and pay you on the spot. Once you agree to have them take your car the company will take you name and address and will come out to get your car. If you call early in the day they should be able to pick the car up the same day, but in any case it shouldn't take longer than 1-2 days for them to come and get your car. The best companies will pay you cash for junk cars on the spot when they come for your car while others may make you wait while they process and mail a check to you. Once they take the car they will typically take it to a junk yard and will strip certain valuable parts from the engine such as the water pump, carburetor and possibly even the transmission. If these parts are in good shape they can have them refurbished and sold. In fact, if you know how to get rid of used auto parts you may want to strip these parts yourself before selling your junk car. Once they have the reusable parts the rest of the car is sent to a metal shredder. Surprisingly, shredding and entire car takes under a minute. The shredded metal is separated by magnets and the other parts such as carpet and upholstery are thrown away. Once the different types of steel are separated they are sold in bulk to steel companies or others who may have a use for them. The whole process of the cash for junk cars industry is beneficial not only to the consumers who get reimbursed for what they thought was worthless, but also for manufacturers who now pay less for steel and for the environment in a variety of ways. Depending on what type of car you have you might get as much as $1,500. Often the bigger trucks and SUV's command a higher price because there is a greater amount of steel involved. In any case, you weren't doing anything with that junker anyway and who doesn't need an extra few hundred dollars.